The Hipwaders are a band with such a sound. 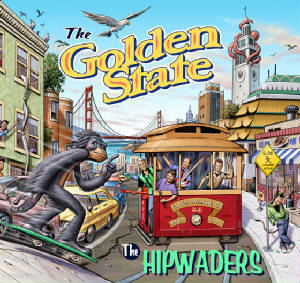 As the title of their fifth CD, The Golden State, implies, this is a California group, and their music nods to a wide, eclectic range of home-state icons, from the Beach Boys to Camper Van Beethoven. Lead singer/guitarist Tito Uquillas adds his own thumbprint to the mix with his college-radio-style vocals, sort of a mix of Michael Stipe, Fred Strickland, and Cracker's David Lowery. The tunes are catchy, daring in their use of unusual harmonies and vocal lines, and altogether enjoyable to kids and parents alike. That alone makes the Hipwaders a good choice to listen to, but this group also draws parents—who are usually, let's face it, happy when kid bands are good enough to be mere toe-tapping background music—into the lyrics more than usual. That's not because they don't cover kid subject matter; The Golden State features pet dogs, bullies, toy trains, and the like. It's more that the Hipwaders...approach everything a little differently. "Hey, Josie," for instance, is a song about a new baby on the way, but its anthemic chorus—simply "Hey, Josie, baby come on"—funnels the anticipation into power pop from some lost summer beach hit of the '80s or '90s. They follow this offbeat way of tackling typical topics throughout the album—"Stand Up to the Bully" savvily uses a ska sound (think the English Beat by way of Vampire Weekend) to give its message proper grounding rather than the expected parental naivete; the laid-back, Cars-esque "Slow Children at Play" addresses why kids gather to play on pavement rather than in their backyards. Every song nails the perfect tone in its writing, speaking to kids the way they want to be spoken to: as an audience worthy of respect and direct discourse. The Golden State is that rare kids' album that the whole family will listen to all the way through—and even be a little disappointed when its 16 tracks are done.